Scholastic golf in Delaware may change its rules for competition, thanks to increased participation by girls in the Henlopen Conference and statewide. The Board of Directors of the Delaware Secondary School Athletic Association (DSSAA) will meet May 10, 2001 to discuss a proposal from the Henlopen Conference. The conference requests that girls on the golf teams be allowed to hit from the front tees, instead of the intermediate tees that all players now must use. As Hitchens noted, the state tournament is a limited field team event. Nonetheless, tournament rules also permit 24 individual golfers to participate, whose school teams fail to qualify. That rule helps keep good golfers involved in the sport, even when their school’s overall talent pool is a bit thin. Bob DePew, Executive Director of the DSSAA, said he didn’t know about the apparent past practice in the Henlopen Conference until he was contacted. He then wrote a memorandum to the scholastic athletic directors and golf coaches on April 9. DePew’s memo noted that DSSAA bylaws follow USGA rules, except as modified by the Board of Directors. DePew contacted David Donnelly, the USGA’s Manager of Competitions. Donnelly confirmed that all players in USGA scratch competitions must hit from the same tees. DePew estimated about 20 to 30 girls play scholastic golf each year statewide. A school may have one or two players (such as Cape’s Christina Wagamon and Shannon Prettyman), but no Delaware high school has enough participants to field separate girls’ golf teams. “There will probably be girls’ teams eventually, but not yet,” DePew said. One potential compromise could be to hold unofficial girls’ conference and state tournaments, using the same tees as the boys, so that the girls’ scores can possibly count for their school in the official event. Player qualifications for the girls’ event could be based on the individual player standards now used for the state tournament. Adding a dozen or so girl golfers to these limited field events shouldn’t be too burdensome. 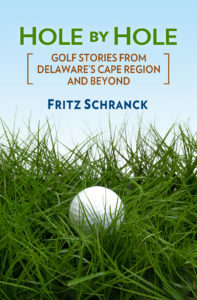 It might help promote girls’ golf, and increase participation to the point that separate girls’ teams become a reality in Delaware. The Cape Henlopen golf team continued its winning ways after spring break, with a 158-190 victory over Caesar Rodney on April 24 at Rehoboth Beach Country Club. Tyler Witman took medalist honors with a par 36 score. J.J. Oakley followed with a 39, with Mark Johnson’s 40 and Adam Talley’s 43 completing the scoring for the Vikings. The team next travels to Sussex Pines Country Club to play Sussex Central on April 26.